Ever needed a quick dessert? This is the perfect solution. Made in minutes and can be baked whilst your guests are awaiting your dessert. You can make it with other fruits like strawberries or peaches too. Mix the sifted flour with ground almonds, baking powder and salt. Set aside. Whisk the eggs with the sugar in a large bowl until thickened and double its size. Whilst still whisking, pour in the milk, the almond and vanilla essence and Amaretto. Add the flour and mix all well until combined. It should look like a smooth thick pancake batter. Grease either individual ramekins or else a 26 cm round pan. Sprinkle with a little sugar. Place the cherries in the bottom. Top with the batter. Arrange the cherries decoratively. Put in the oven and bake for about 30 minutes until the top is golden brown. Leave slightly to cool and then dust with icing sugar. Serve whilst warm with fresh cream or ice cream. It is also nice chilled slightly. * The French leave the cherry pits in. 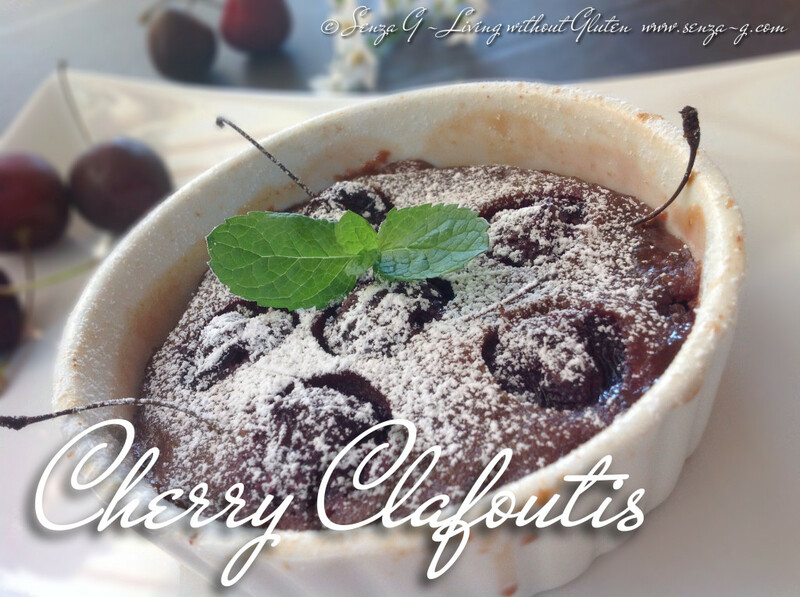 According to them they give the clafoutis a distinctive almond flavour.